Several approaches have been proposed to model biological systems by means of the formal techniques and tools available in computer science. To mention just a few of them, some representations are inspired by Petri nets theory and others by stochastic processes. A most recent approach consists in interpreting living entities as terms of process calculi, by composition of a few behavioural abstractions. 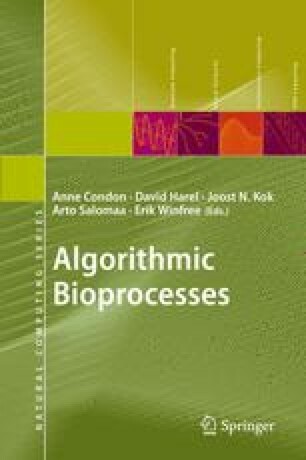 This paper comparatively surveys the state of the art of the process calculi approach to biological modelling. The modelling features of a set of calculi are tested against a simple biological scenario, and available extensions and tools are briefly commented upon. This work has been partially sponsored by the PRIN 2006 Project BISCA—Sistemi e calcoli di ispirazione biologica e loro applicazioni and by the FIRB project RBPR0523C3.